as Model Plan #132 and costs �.40 plus �24 p&p. 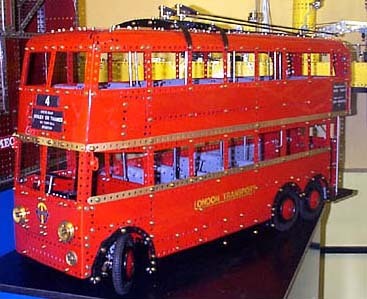 "The March 1946 issue of Meccano Magazine included a photograph of Noel Ta'Bois' model of a London Trolleybus. Seeing this magnificent model was a landmark in my Meccano history and initiated a sequence of events which ultimately led to my opening M.W.Models Meccano Shop. My gratitude to Noel was communicated to him at one of the Henley Meccano Exhibitions, and he was kind enough to let me have a comprehensive set of photographs of his original model. The late Roger Wallis was similarly inspired by an article in the series 'What Shall I Build Next' in the Meccano Magazine of May 1952, which included a picture of Noel's Trolleybus. He was determined to re-create this model, and over the next few months succeeded in doing so. Noel was so pleased with his re-creation, that he kindly gave Roger the original number and destination cards from his own Trolleybus, to be used on this new model. Details of the prototype and a comprehensive Parts List."